To create a website that targets trainee journalism students, the main aim, I find, is to stick to a similar style of news websites. Therefore, I have looked at the styles of some popular news outlets websites. Straight away you can tell that the style is very clean and fresh from the white background and the sheer minimisation of the content. Although there is a lot of content which is set out uncluttered on purpose. I believe that this is in aid of not confusing the reader and to in a sense tell them what to read. The use of pictures and videos next to the article is very typical of news websites. It gives the reader a visual option as opposed to reading the article straight away. I think this is a very good idea for a website as it lets the reader choose what they want to read from the top news stories. Somebody could just visit the website to read a specific article and they would know which one it is just from the visual option. Moving on to the heading of the website, you can see that the colour choice used is a variety of reds. This is also very typical of news based websites. It instantly makes the reader realise that they have come to the right website. Other features of the heading include the menu. The menu breaks up all the categories of news that the BBC cover. I think that this makes the function of the website extremely user friendly. As well as the search bar. I believe these two items are key to include so that the users of the website can find what they want quick and easy. As you can see, this website is incredibly similar to the BBC website and has the same functions. I think that I should carry on this news style theme with my website. Sky News’ website differs a little from the BBC and The Hull Daily Mails, but, it still has exactly the same functionality. The colour scheme is just slightly braved and differing from the house style of news websites. The Telegraph is much like the SKY News website in the sense that it is brave with it is colour scheme. Barring this, it still functions the same as the other four news websites I have researched. Although the audiences slightly differ they all work the same way. 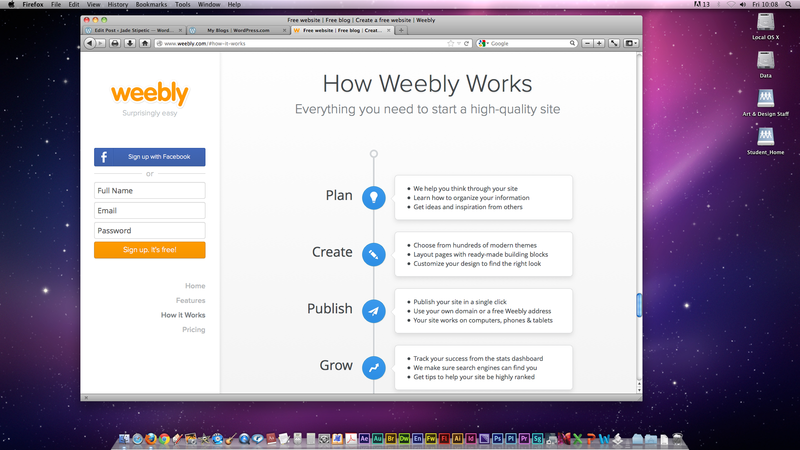 The free drag and drop website builder, Weebly, appears to have a lot to offer in terms of creating a news based website for students. According to Weebly’s website many famous names have used the website as a starting point for their website ideas, such as – WSJ. , BBC, Time and Newsweek. To see that big name news outlets have used this website to develop their identities online makes me want to explore the website to find out what it has to offer my website idea structurally and design wise. I need the website to be aesthetically pleasing so that students are drawn toward it and feel comfortable when using my website. Although I don’t hold the necessary skills to create a website using HTML, i find drag and drop websites easy to use. The website hosts clean and sophisticated designs which i think will look new age and fresh to appeal to the student audience. Having spoke to my tutor i think it would be a great idea to purchase a layout for a professional edge to my work as opposed to using a free layout, i find that because the layout is free more people will use it for their work and i would like my website to have an individual feel. IM creator is a website builder, I liked the look of the video it uses to promote the website so I decided to research into it. The website has a range of designs which are completely free to use if needed. They use categories to help you narrow down your style website. Portfolios, news, photographers, designers, artists, restaurants and other. I think this could be a useful tool for someone who wants to create a website with the template already created however, I feel that it would be for my work, as it is very specific and needs a lot of research to enable me to effectively target my audience I think it would be better to start from scratch. The website has a lot to offer within the world of social media, you can create links and updates from certain social media websites when using the IM creator. Such as, Facebook, Twitter, Pinterest and Google+. For training journalists and actual journalists I think this is excellent as social media is very current and rapidly developing. It helps people to publisise and share their work which reaches thousands. A key to revealing if a website lives up to its role could be who it is accredited by. This website is accredited through so big names such as The New York Times, TNW, CBS and Venture Beat. If they accredit the website, it usually means that they have mentioned or reviewed the websites work on there websites or magazines/newspapers. After researching for other websites which host student journalist’s articles, I only found one. The website is called Kettle Mag www.kettlemag.co.uk. Looking at the website it has quirky and fun aspects to it, contributors such as fonts, colours and big pictures appear to hold a big role when aiming at a mostly teenage audience. However, the website is a online magazine and I wanted my website to be taken in a more serious light through creating a newspaper feel for an air of professionalism as opposed to a casual feel magazine. The website also hosts large hit videos which are currently circulating the web. However, I think that i could use this idea through having a variety of skills used on my website. For instance, Journalists are expected to be able to take high quality photographs and edit video footage together. Therefore, perhaps the idea of having articles as the websites prime function and having videos and photography created also created by student journalists could give the websitee a better feel targeting people who are passionate about journalism but prefer the radio, photo journalism or even video journalism.